But, as with so many gold diggers, I had a genuine appreciation for the frills and the glamour. I still think about Barbie’s ear rings, and I still have a thing for princesses. Not real ones, I’m not mental. Pink, fluffy, long-haired, graceful ones. Needless to say, I am very, very excited about the forthcoming Disney Rapunzel film, Tangled. I think it looks absolutely perfect. Plus one with wings, a “baby” one, and quite possibly some of these – recently back on sale at Firebox. I was slightly sickened by any with freckles, and Gusty on the left here was my fave, because a) such pretty colours and b) An actual unicorn! No contest. 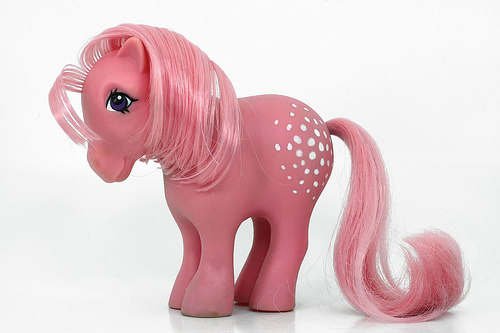 In fact, they diversified from the standard pony model quite early on. There were, iirc, babies, flighted ones, sparkly ones, ones with terrifying gemstone eyes, ones with no back legs (mermaid ponies? )… I mean, even on the standard models in the mid-80s, there were dozens and dozens to choose from. The interesting thing is watching how far they’re prepared to take the metaphor. There must be a list somewhere at Hasbro detailing what these ponies will and will not tolerate. MLPs ARE FREE SPIRITS AND WILL NEVER BE RIDDEN. MLPs LIKE TO LOOK PRETTY AT ALL TIMES. MLPs MAY ATTEND A BEAUTY PARLOUR IN A TRAILER BUT THEY GO TO BED LIKE NORMAL PEOPLE. MLPs MAY WEAR LEG WARMERS BUT NEVER A SADDLE. 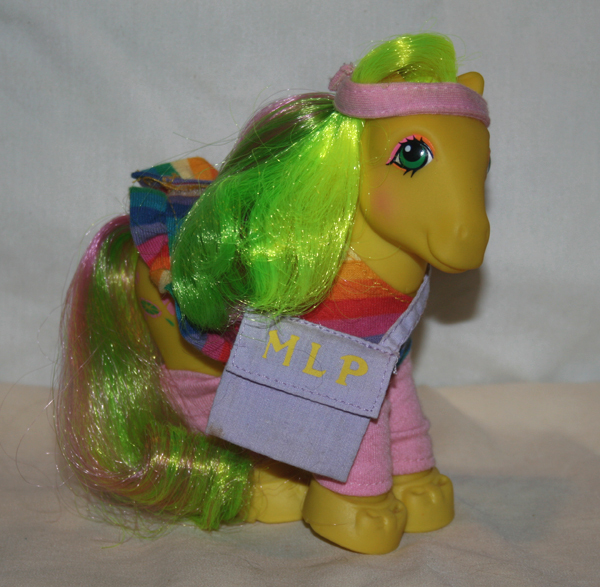 MLPs MAY DRESS UP IN ANY OUTFIT THEY SEE FIT, AND EVEN THOUGH THEY ARE HORSES NO SPORT IS BEYOND THEIR REACH. MLPs MAY TAKE THE FORM OF MERMAIDS, FAIRIES, SEA-HORSES, BIRDS OR GEM-EYED MONSTERS. THEY ARE DEFINITELY ALL STILL MLPs THOUGH. You see, the genius is making the horses mute, mysterious characters in themselves, and imposing some fairly strict rules about what they can be, which are then stuck to, rigidly, for decades. NB I have no real idea what’s going on with them these days, and to be honest, I’m too scared to look. 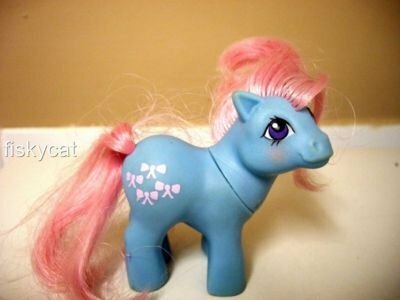 Tell me about your My Little Ponies. 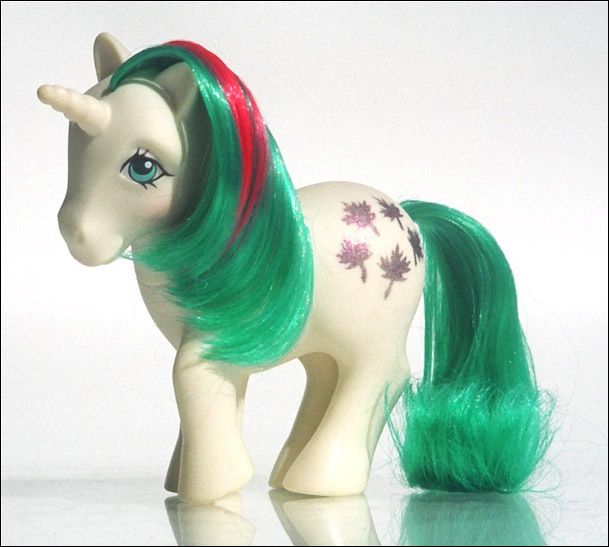 I don’t understand people who don’t love My Little Ponies. Why do you hate beauty? This entry was posted on	January 24, 2011 at 8:10 pm	and is filed under Uncategorized. I was the same way with Dinky Toys. My “best friend” had a huge collection. When I was 3 I saw him across the busy city street with a toy wagon full of them. I broke and ran from my mother. The lure was more powerful than my need to survive. 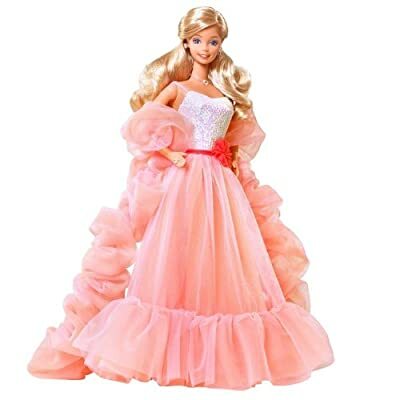 My grandmother used to make beautiful clothing for my sister’s Barbies. what do you think folks? Is this a cry for help from Leila? Should we parachute Barbies over Borehamwood. I am willing to coordinate the mission. When I was a small child I also used to hit up rich people for colouring books. “How are you young man?” “I’m fine but I don’t have any new colouring books. I actually still have some of my MLPs. I got rid of a lot of them when I was a teenager, but somehow, a boxful survived. I have a mermaid pony, one of those gem-eyed monsters, and even one that was exclusive to the MLP fan club. The one kind of pony I never had, and still kind of feel the absence of, is one of the Big Brother ponies. They were ponies, but male! 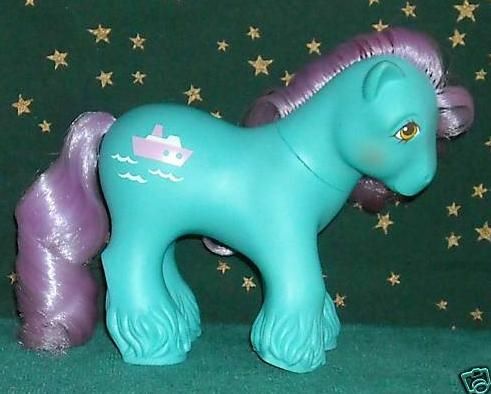 And apparently this one is “the only pony who could drive.” That sounds like madness to me. Your comment about the ponies being mute and mysterious suggests you never read the comics or watched the TV show/movies, though? The MLP movie where purple lava – “smooze”? – flooded the land was awesome, in my memory. Ah I did have some of the comics but I didn’t really like them, partly because I thought the ponies really wouldn’t speak or prance about in such an undignified way, so these comics were some kind of offensive “interpretation” of the ponies’ true personalities and lives. Am still clinging to that wishful thinking it seems. I am so jealous of your collection and knowledge, but glad to have stumbled across an expert. I wish I’d been in the fan club. Can you explain to me about the rubber ring ones? I have a memory of baby ones in rubber rings. Were they baby mermaids? Can you put a photo of your ponies up somewhere? Special male ponies! How did I miss that? I always got a kind of male energy from Apple Jack to be honest. Love that there’s a pony that can drive. What would that car look like, I wonder. Talk about putting the cart before the horse. God, it’s terrifying that I have the same personality now that I did at age 6. I’ll try to take some photos later. I’ve got a baby mermaid one with a rubber ring, and it’s never before occurred to me that that doesn’t make any sense at all. Why would an aquatic pony need a flotation device? Odd. Part of me wishes I still had all the accessories and stuff I used to have – there was a ballet studio! – but mostly I’m aware that I’m a grown woman and it would be slightly troubling if I did still have all that stuff. Haha, ballet studio for ponies. I wouldn’t want to live underneath that. The only accessory I had (apart from a couple of ‘outfits’) was the Beauty Parlour. Did you have the castle? I remember seeing TV ads for that. I completely agree that your friend’s behaviour is unacceptable. You can’t give baby Applejack to another horse to raise. And you can’t give them YOUR OWN NAMES, Jesus! These are real people we’re talking about here, not toys! Took me a long time to remember the name, but the one with wings I had was definitely Honeycomb, one of the more neon of the gang. 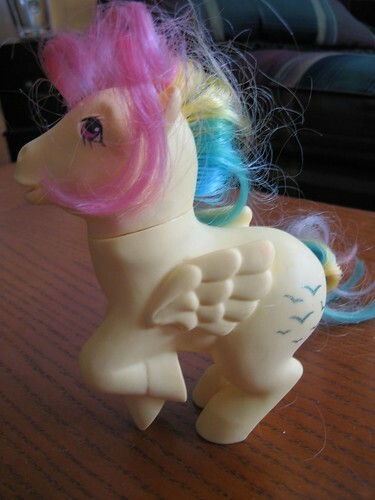 According to Wikipedia, it’s a “Pegasus Pony” rather than a “Flutter Pony”. SO JEALOUS of your boy pony. Flutter ponies are the ones with the stupidly delicate wings, aren’t they? I’ve only got one intact (this one!). That one has a cheek tattoo! I didn’t have any of the butterfly style ones at all, they were a bit slimmer than the normal ones, but I still can’t see those wings getting them off the ground. I think my neighbours think I’m insane. Have some photos. That kept me entertained for an embarrassingly long time. 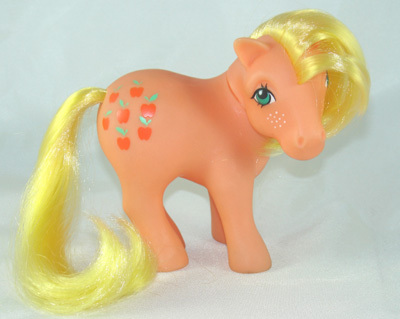 Posey was always a favourite, like the ‘popular blonde girl’ of the ponies. — and it came with a free little cat! 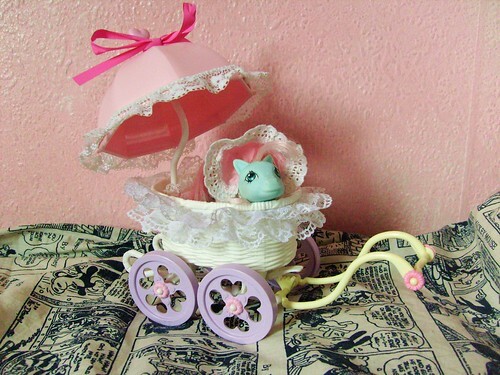 Was always jealous of anyone with Majesty, who I think only came with the castle…and OH MY GOD OF COURSE SPIKE THE BABY DRAGON. What’s weird is that I have a dragon, but not the castle, annnnd I’m not sure I had Majesty? haha, great. You know, I’ve been looking at some Sindy fan sites, and have developed a fresh appreciation for her as I realise that a) she was really cute and b) she was actually something of a style icon. Do you remember getting the Sindy outfits separately, pinned up on bits of card with cellophane over them?